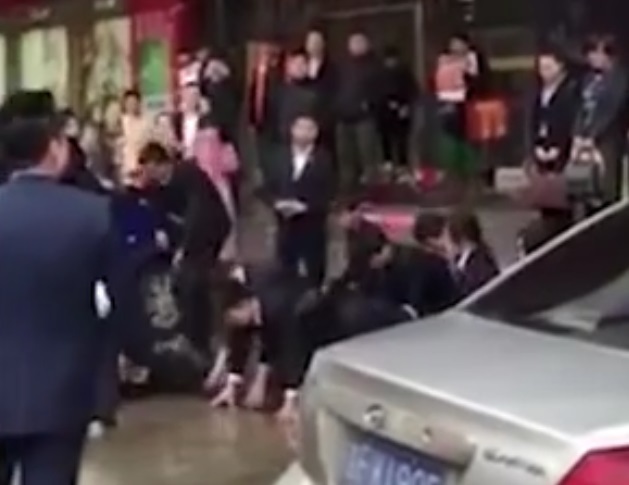 A car rental company based in Jilin in Northeast China has come under fire after a one-minute video showing ten of the firm’s employees crawling over a wet street went viral. According to the Chinese language publication, The Paper, the company’s boss initially intended to crawl along the street himself in order to motivate his staff to meet their sales targets. In an unexpected turn of events, ten workers volunteered to take their boss’ place instead. They were filmed crawling for around 200 metres behind a man carrying a red flag. The ‘motivational’ drill occurred on 7 March with bystanders recording the event. One video went viral on Weibo – China’s largest social media network. Both the company and its employees were slammed online. “Such thorough brainwashing, I admire those leadership skills,” one Weibo user wrote. “Why would anyone endure such humiliation for a monthly salary?” another asked. Responding to the criticism, the boss of the company said that he had merely wanted to “lead by example” and hadn’t expected the drill to create this much public attention. Some commenters questioned whether the employer had broken the law in this case. From the Labour Law of the People's Republic of China, Article 96, employers are forbidden from engaging in the “humiliation, corporal punishment, beating, and illegal search or holding of labourers”. Those found guilty can be sentenced to 15 days in jail, a fine or a warning. In a similar incident last October, a Chinese sales team of 10 employees were also forced to crawl around the shores of Ruyi Lake in Henan Province after failing to reach their sales targets.